It is a human nature to debate over every topic, such as weather, food, nature or beauty. We are the generation that pays more attention to the number of calories in a food than its nutritional value. Now, we are not saying that you should not keep a check on your caloric intake, but you should also pay attention to the overall health benefits, health hazards and nutritional value of the food you consume. Most of the foods that are being consumed today, especially by the youngsters, contain large quantity of processed sugar and unhealthy fats. And too much added or processed sugar and fats is not good for both your waist line as well as your health in general. It is better to turn to natural sweeteners like honey and agave nectar, a detailed comparison of which is featured in this article. Honey and agave nectar are sweeter than most of the alternatives present in the market so only a small amount is needed to enhance the flavor. But this certainly does not mean that you should over indulge in natural sweeteners because natural or synthetic too much of anything is bad for the body. Honey has been a part of human diet for many centuries while agave nectar is relatively new. The main difference between honey and agave nectar is the source from which they are extracted. While honey is produced by bees and is extracted from their hives, agave nectar is extracted from a variety of plants from the genus Agave. Agave nectar is also a great alternative for vegans and vegetarians that avoid honey. Agave nectar/syrup is made from Agave americana and Agave tequilana plants. The leaves of these plants are cut off after it has reached a maturity of 7 -14 years. Juice is extracted from the core of the leaves and it is then filtered. At this point, the juice mainly consists of polysaccharides (complex sugar) so it is heated to break it down to simpler sugar mostly fructose and a small amount of glucose. The juice is then concentrated to a syrupy consistency that is slightly less viscous than honey. The color of agave nectar varies from yellowish brown to dark amber. Agave nectar is mostly produced in Mexico and South Africa. The sugar present in honey is dehydrated so it resistsfermentation. Enzymes are added to transform its chemical makeup and alter pH. Like agave nectar, honey is initially in the form of polysaccharides (complex sugar i.e. sucrose). Invertase and digestive acid present in honey bees’ stomach then help convert polysaccharides into monosaccharaides like glucose and fructose. A honey bee changes the monosaccharaides into honey by regurgitation the ingested fluid numerous times, till it is partially digested. Even after the last regurgitation the honey is still in aqueous form. It is converted into a viscous fluid by evaporation and enzymatic activity. Honey can be gathered from wild bee colonies or man-made beehives. The honeycomb from the hive is removed and honey is extracted by either crushing the honeycomb or using a honey extractor. Honey is produced worldwide and is mostly used in every country. The glycemic index (GI) is a way to calculate the relative influence of food on blood sugar level. Food that have higher GI contain more carbohydrates that can be easily and quickly converted into sugar, which in turn causes a rapid increase in blood sugar level. Foods with higher glycemic index are generally considered harmful for health. Similar to glycemic index, the Glycemic load (GL) also helps characterize the potential effects food has on blood sugar level. A food with high glycemic index, means that it contains carbohydrates that can be rapidly converted into sugar, but if the food does not contain large amount of carbohydrates per serving then there will not be much impact on the blood sugar level. Honey has a higher glycemic index and causes a more rapid raise in blood sugar level than agave nectar. Agave nectar mostly consists of fructose while honey contains large amounts of glucose, it is easier and faster to turn glucose into sugar (1). The glycemic value of agave nectar and honey depend on the variety used. Following is a table that comparers the glycemic load and index of honey and agave nectar. Honey contains about 6g carbohydrates per teaspoon while agave nectar contains about 5g per teaspoon. Honey also contains small amounts of minerals and vitamins like vitamin B6. Agave nectar contains small amounts of calcium, potassium and magnesium but they are nutritionally insignificant. Although honey contains more calories but it also contains more trace elements than agave nectar. Comparison of nutritional values of agave nectar and honey is shown below. The things we eat are digested in our stomach and the nutrients are absorbed into the blood. The blood then transports nutrients to various parts of the body. So in the vernacular, we are what we eat. These days we mostly fill our bellies with junk food so this ultimately means that we are filling our bodies with junk. Proper nutrition is not only essential for a health body but also for a happy mind. These days people, especially the younger generation, do not know the nutritional value or the side effects of the food they consume. Taking care of our body and health is our duty so make sure to take a peek at the health benefits and nutritional values of the products you consume. Always remember that a healthy diet leads to a health body and mind that paves the path to a happy life. Low glycemic index: Agave nectar has a low glycemic index as compared to sugar. Low glycemic index means that agave nectar does not raise the blood sugar level as much as sugar. Agave nectar contains high quantity of fructose that does not impart as prominent effect on blood sugar as glucose does. Agave nectar is a great alternative to sugar for people who are at risk of diabetes or who are diabetic. Calcium: Agave nectar has many trace minerals in its composition including calcium and potassium. Agave nectar accommodates the absorption of calcium into the bone to increase bone density and the overall state of health. Calcium deficiency is a rising problem in the younger generation especially females. Calcium deficiency is something that should not be taken light because it can lead to serious problems like osteoporosis. Calories in a cup: Agave nectars has considerably less calories in one cup than the plain old sugar. According to the estimate of some researchers, if you replace a cup of sugar with a cup of agave nectar you save yourself from about 300 calories. Switching from sugar to agave nectar is a great way to cut back on calories and lose some weight. Adding small quantity of agave nectar to your weight reducing diet is a great way to incorporate some flavor into your diet, while at the same time making sure to keep a check on the calorie intake. Organic: Agave nectar is an organic sweeter, which is extracted from plants that usually grown in the dessert. Agave nectar is a great alternative for vegans and vegetarians that want to avoid food from any animal source. These days many of the products present in the market are chock full of processed sugars that are bad for health. So using agave is a great way to avoid processed sugars that wreak havoc on our health. Immunity boosting: Agave nectar contains saponins that is also present in the roots of some plants. Saponins have the ability to boost the immune system and act as anti-inflammatory agent. Healing: Agave nectar was used in ancient times by the Aztecs for its medicinal properties. The Aztecs used to combine agave nectar with salt to treat skin infection and to dress wounds. Antibacterial effect: Agave nectar has numerous health benefits and one of the most important benefits is its function as an antimicrobial. When applied to skin, agave nectar is effective against pyogenic bacteria like Staph. Aureus that cause skin infections. Agave nectar is also efficacious against enteric (intestinal) bacteria. Natural energy booster: Honey is a superb source of energy. 1 tablespoon of honey contains about 17 grams of carbohydrates. Honey is a great reservoir of unprocessed sugar in the form of fructose and glucose, which directly and rapidly enters the bloodstream and gives you a fast energy boost. This boost of energy and rise in blood glucose is great for work outs and exercise. Sleep aid: Honey can be a great aid for a sleepless night. Before you start pumping your body full of sleeping pills, try honey to help soothe you to sleep. Honey helps the release of a neurotransmitter called serotonin, which is responsible for elevating mood and happiness. Serotonin also helps determine the length and quality of sleep. Honey also contains some amino acids that aid the production of serotonin in the brain. Memory boost: Honey is a sweet nectar that contains many antioxidants that prevent cellular damage in all parts of the body including the brain. A study was conducted in which menopausal women consumed a spoon full of honey daily. The results showed boost in the memory of postmenopausal women, which can be used as an alternative therapy for hormone associated intellectual decline or dementia. Cough suppressant: Honey has been used for centuries to treat pesky coughs. Honey is especially a gem for children 1-5 year of age with nighttime cough. 2 tablespoons of honey 30 minutes before bed time help a great deal in reducing cough frequency and intensity. Honey is a viscous fluid that coats the throat and the sweet taste helps soothe the irritated nerve endings. Treatment of wounds and burns: Honey has been known for its medicinal properties for many centuries. Honey is a natural anti-bacterial, which can act both within the body and externally. Honey is effective against many strains of bacteria and is sometimes used as an alternate therapy. Honey is also used to treat burns and for wound dressings. Prevents low white blood cell count: Research has shown that honey is an inexpensive and promising way to prevent the drop in white blood cell count caused by chemotherapy. In a clinical trial, patients undergoing chemotherapy took two teaspoons of therapeutic honey daily. The results were promising and showed great potential for the use of honey to prevent neutropenia (low white blood cell count). Like other things in life, there are always some goods as well as some bad aspects associated with one thing too- even if you don’t see it. No matter how good something looks or how good it tastes, there is always a catch. When you eat something, always keep in mind the pros and cons of consuming that food and adjust your diet plan according. Fructose malabsorption: This is a digestive disorder in which there is improper absorption of fructose from the intestine. This results in increased concentration of fructose in the enteric system (gut). Agave nectar contains high quantities of fructose so there is a risk that consuming large quantity of agave nectar can cause fructose malabsorption. People with fructose malabsorption are cautioned about use of agave nectar. Metabolic syndrome: This syndrome is a collection of 5 medical conditions: obesity, elevated blood pressure, elevated fasting plasma glucose, high serum triglycerides, and low high-density lipoproteins. There is a slight risk that consuming copious amounts of agave nectar can lead to metabolic syndrome. Although it is considered best for diabetics, but too much use should be avoided as too much use can precipitate the risk of diabetes. Hyperinsulinemia: This means increase in insulin level in blood. This is often mistaken for hyperglycemia (diabetes). People with hyperinsulinemia should avoid agave nectar because it has the ability to stimulate insulin release. Botulism: Clostridium botulinum is a bacteria that maybe present in honey. This bacteria cause’s botulism, which is potentially fatal disease. The symptoms start as mild abdominal discomfort, weakness, lethargy and eventually leads to paralysis. Toxic honey: Honey that is produced from some plants might be toxic. Honey from following plants can cause honey intoxication: rhododendrons, mountain laurels, sheep laurel, and azaleas. So to avoid this, make sure you know the source of the honey you are consuming. Before we jump into the remedies for laryngitis let’s just get a clear view of what laryngitis is first. Laryngitis is the inflammation of the larynx (voice box) and it has a number of causes, most common being excessive strain on vocal cords like screaming or cheering. The other causes of laryngitis can be viral or bacterial infections, trauma or allergies. The symptoms of laryngitis are hoarseness and weak voice. Laryngitis usually lasts about 2 weeks but if lasts longer than 2 weeks that its chronic laryngitis and you need to see a doctor in such situation. There are many over the counter drugs present for laryngitis but why pump your body full of drugs when there are so many easy home remedies for laryngitis. Honey is the oldest known remedy for laryngitis. Drinking honey mixed in lukewarm water is an effective and health way to treat laryngitis. Honey provides soothing and lubricating effect that helps ease the soreness in the throat. Honey tea is also provides an excellent from the soreness caused by laryngitis. Agave nectar has much the same effect on laryngitis as honey (4) but the use of agave nectar for the treatment of laryngitis is not widely observed. Safer for children: Agave nectar or honey? Honey has been used for medicinal purposes for many centuries. In some religions as well as in some ancient cultures honey was used to treat many ailments. Even today, warm honey is used worldwide as a home remedy for sore throat. Honey dissolved in a little of warm water is an old wife remedy for a child’s cough. But what most mothers do not know is that honey is not safe for infants younger than 1 year of age because of the presence of spores of a bacteria called Clostridium botulinum in it. This bacteria cause’s botulism, which is a rare but potentially fatal disease. Botulism is infants in called flappy bay syndrome. Infant botulism occurs as the result of ingestion of spore of Clostridium botulinum that colonize the small intestine of the baby. The bacterial spores release botulinum toxin that is taken up by the blood and transported through the entire body causing the blockage of release of neurotransmitters, which are responsible for proper functioning of muscles and nerves. The symptoms of infant botulinum are constipation, lethargy, difficult in feeding, irritability, leading to descending flaccid (slack) paralysis of the body. The fatal element of infant botulism is paralysis of the respiratory muscles. The reason why infants are more prone to botulism is two folds. First is that the normal flora in the intestine of the baby is inadequate to fight and stop the colonization of Clostridium botulinum and the second reason is that levels of bile acid (this inhibits growth of C. botulinum) is lower in infants than adults. So it is strictly advised to not give honey to infants. Agave nectar has not such spores, so it is a healthy, natural and safe alternative. Maple syrup: When we hear the words maple syrup we immediately thing about pancakes or French toast. But maple syrup is not only superb with pancakes, it is also a great alternative for honey because it provides the same earthy robust flavor. Using grade B maple syrup in many recipes is better than grade A maple syrup. Grade A maple syrup is highly filtered, so you end up using a larger quantity in a recipe. While grade B maple syrup is sweeter so that means that a lower quantity is needed. Yacon root syrup: This is a relatively new product. Yacon root syrup is extracted from the tuberous roots of a plant called yacón. It is surprisingly rich in iron that is deficient in most vegans, so it is a great alternative for people that avoid honey. Yacon root syrup also helps aid digestion and relive constipation. Coconut nectar: Coconut sugar is widely known but coconut nectar doesn’t have the same fame. Coconut nectar is a great organic alternative for honey because it has a low glycemic index (GI) and it is also rich in minerals. Coconut nectar is a source of various B vitamins. It is also a great alternative for vegans who avoid honey. Date paste: Date paste is the easiest and most readily available alternative to honey. Date paste gives the same earthy flavor to any recipe as honey. Dates are available in almost any grocery store around the world. You can buy date paste of different varieties and better yet you can make your own date paste. All you need to make date paste is a handful of dates and a little water, throw them into the blender till you get your desired consistency. The best thing about date paste is that is does not need to be refrigerated, so you can use it as a portable snack while traveling. Stevia products: This is one of the oldest artificial sweeteners present in the market. It is present in the market in form of powder and concentrated liquid. It is a great alternative for honey if you are on a diet. Diabetics can also safely use stevia because it does not interfere with the blood sugar level. Honey has been used in a variety of dishes for many centuries. Honey is not only used in baked goods but also in savory dishes. Honey has the ability to add an extra layer of flavor to a dish as well as texture. For its flavor enhancing ability honey is used in hot teas or even cold beverages. Agave nectar is a relatively new alternative to honey. Agave nectar has some advantages over honey. It has a more natural flavor than honey and does not interfere with the flavors of other ingredients in a dish, while honey tends to mask other flavors. Agave nectar is also a great alternative for vegans and vegetarians that want to avoid any animal products. People who tend to find the flavor of honey overpowering will find the natural flavor of gave nectar more palatable. Another plus point in favor of agave nectar is that it has a longer shelf life than honey. Now image that you’re baking something you open the cupboard door to get the honey and you find a grainy solidified unpourable mess instead. While it is true that you can re-liquefy honey by heating but you have to do it carefully and on low heat otherwise the honey will caramelize or burn. Agave nectar is less viscous, so it is easily and quickly dissolved even in cold beverages. Agave nectar is 40 times sweeter than sugar, so start by using half the quantity of sugar you usually use. It has low glycemic index, so it can occasionally be used in drinks for diabetics. The same quantity of agave nectar can be used to replace maple syrup or honey. Add milk, water and quinoa in a medium pot. Bring this to boil on high heat then cover it and let it simmer for about 15 minutes. No turn off the heat and let it stand for about 5 minutes. Mix in the barriers, ground cinnamon, chopped pecans and agave nectar. Transfer it into a bowl and serve lukewarm (6). When baking with honey you need to beat it twice as longer and twice as vigorously to get the desired results. Honey is sweeter than sugar, so replace one cup of sugar with half cup of honey. Add ½ teaspoon of baking soda for one cup of honey to neutralize the acidity of honey. Reduce the oven temperate of the stove heat when cooking honey because it becomes brown and crispy rapidly. Preheat the oven to 350 F. Lightly oil four mini loaf pans (6 by 3 by 2 inch pans). Combine all the dry ingredients in a bowl and stir thoroughly. Take a large bowl add brown sugar and two eggs. Beat for 1 minute with an electric mixture on high speed. Now add honey, coffee and vanilla extract and beat for 1 minute on low speed. Pour the dry ingredient mix and walnuts into the egg mixture and stir to thoroughly combine all the ingredients. Pour the mixture into the loaf pans and place in oven for 15 minutes, now rotate the pan and cooking for 15 more minutes or till a toothpick inserted into the center of the loaf comes out clean. Take the loaf pans out and let it cool for 10 minutes, now run the knife alone the edge of pan to remove loaves. Cut the loaves when completely cool otherwise it will crumble (7). 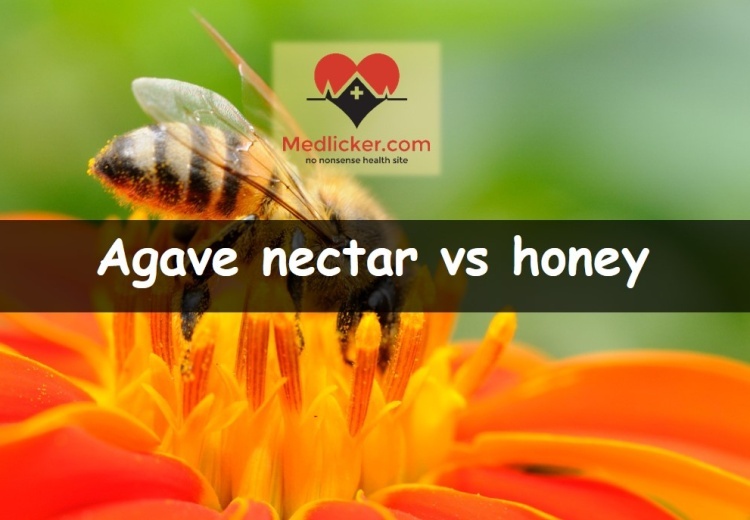 This is the end of our detailed comparison of agave nectar vs honey. By now you should know all about health benefits, nutritional values, side effects and risks of both substances. You may try out some of the recipes featured above. Please bear in mind that this article is just an informative post and does not replace proper medical advice. You should always seek an advice from your physician if you do not feel well! If you like this post please consider sharing it with your friends on social media.